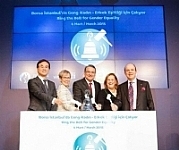 The Gong Ceremony, hosted by Borsa Istanbul, was organized on 6 March with the cooperation between UN Women, the UN Global Compact and the Sustainable Stock Exchanges Initiative to raise awareness about equality between men and women, and to promote the empowerment of women in economic life. The “Ring the Bell for Equality” events were organized in opening/closing gong ceremonies of worldwide stock exchanges to raise awareness of gender mainstreaming and to contribute to women’s empowerment in the economic arena ahead of International Women’s Day on 8 March. 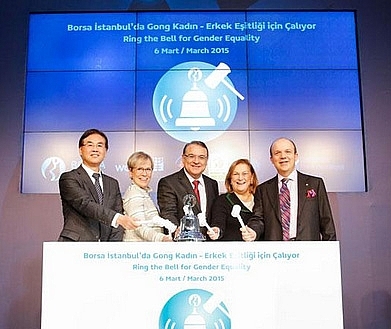 The gong ceremony, hosted by Borsa Istanbul, was organized in the Borsa Istanbul foyer on 6 March at 9.15 am, the time of the opening of the market, with the cooperation of UN Women, the UN Global Compact and the Sustainable Stock Exchanges Initiative. The event was organized as part of the 20th anniversary activities of the Beijing Declaration and Platform for Action which was approved by 189 countries in 1995 and which determines a road map for gender mainstreaming and women’s empowerment. Hüseyin Zafer - The Deputy General Manager of Borsa İstanbul, Ingibjörg Gísladóttir – the UN Women Europe and Central Asia Director and Representative in Turkey, James Zhan – Director of Investment and Enterprise of United Nations Conference on Trade and Development (UNCTAD) and Chief Editor of UNCTAD World Investment Report, Güler Sabancı – Chairman and Managing Director of Sabancı Holding and Member in Board of Directors of UN Global Compact, Dr. Yılmaz Argüden-Chairman of the UN Global Compact Turkey and a Member of the Board of Directors of the UN Global Compact all spoke in the ceremony. Hüseyin Zafer - Deputy General Manager of Borsa İstanbul, said in speech that “While the state offers the infrastructure required for economic growth and development with its policies on education, laws for work life and similar steps, our companies should take the steps that advance gender equality in economic life in Turkey. Ingibjörg Gísladóttir - UN Women Europe and Central Asia Director and Representative in Turkey, mentioned the importance of women’s empowerment in economic life: “Women are disproportionately affected by abuse and discrimination in their offices. Turkey ranks at the bottom among European countries with respect to the participation of women in the labour force. Today, while we are celebrating the 20th anniversary of the Beijing Platform for Action, which sets out an important road map for promoting women’s rights, we would like to highlighting that the more women who work, the higher the growth rates economies record”. Ingibjörg Gísladóttir also added in the speech that UN Women called on all UN member states to work towards “Aiming for Gender Equality by 2030: Take Action” with the purpose of stepping up their efforts for gender mainstreaming, improving the human rights of women and girls and establishing full equality between men and women in the World by 2030. Dr. Yılmaz Argüden - Chairman of UN Global Compact Turkey and a Member of the Board of Directors of UN Global Compact said: “Nations that fail to provide women with the opportunities to work in equal conditions cannot develop. Therefore, increasing the participation of women in the labour force is one of Turkey’s 5 most prioritized sustainable development targets in the Global Compact & UNIDO’s consultation. Women’s Empowerment Principles - WEPs - are one of biggest global initiatives being undertaken by the private sector to support the empowerment of women to enable their participation in economic life. The WEPs platform was established in 2010 in a partnership between the UN Global Compact and UN Women. The WEPs platform presents important points for the private sector to take into consideration to ensure gender mainstreaming in the markets and society as a whole. WEPs requires business world leaders to make solid commitments to 7 principles to establish company policies which will carry gender mainstreaming forward. The WEPs has around 1,000 signatories around the world, while it has 42 signatories with 19 newly signed ones. Seven different working groups were established in the Women’s Empowerment working group, in which Bilim İlaç played a role in during 2014. Different companies operate in each working group. These groups were determined with following order: Technical Group, Communication Group, Educational Materials Group, Creating Materials Group, Mentorship/Coaching Group, Support Group, and Preparation Group for WEPs Application Guide. Bilim İlaç will also carry out activities in a spreading the initiative, which is one of the working group’s crucial roles. Accordingly, the Company will play the role of a mentor for institutions seeking consultancy, as well as SMEs, by transferring information and experience to institutions that wish to be a signatory.